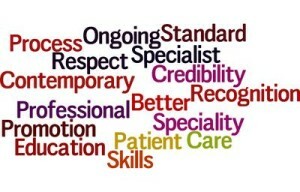 Nursing Essentially commits to respect the privacy of their clients, preserve the confidentiality of information acquired in the course of their work, will treat personal information obtained in a professional capacity as confidential and will not use confidential information or their position of power to advantage themselves in any way. 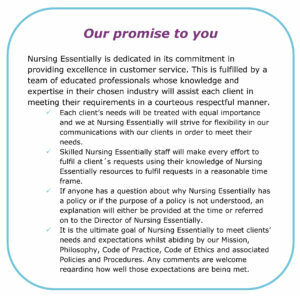 Nursing Essentially respects each person’s wishes about with whom information may be shared and preserve each person’s privacy to the extent this does not significantly compromise or disadvantage the health or safety of the person or others. Nursing Essentially complies with mandated reporting requirements and conforms to relevant privacy and other legislation. Most consultations are held via Skype, email or telephone. Limited appointments are conducted in the Nursing Essentially office (South Australia). Nursing Essentially operates under the Nursing and Midwifery Board of Australia Practice Standards and Scope of Practice and the International Council of Nurses Code of Ethics. Gifts, services & financial relations: Nursing Essentially recognises that involvement in financial transactions (other than in a contract for the provision of services) and the receipt of anything other than ‘token gifts’ within professional relationships with persons in their care is likely to compromise the professional relationship. Please See Proof Reading and Editing Guidelines. Maintain dogs in an environment appropriate to maintaining their health, welfare and biosecurity. Do not use dogs with unsuitable temperaments as contact dogs. Alleviate any stress, over handling and overcrowding of dogs to reduce possibility of disease. not exhibit dogs that may have increased potential for aggressive behaviour associated with mating/breeding. Provide adequate barriers and signage to prevent visitors from touching dogs that are not available for touching or that should not be touched. More recently, Flea-borne spotted fever (FBSF) has recently emerged in Australia. In humans, signs of FBSF are non-specific and range from flu-like illness to severe multi-systemic disease. 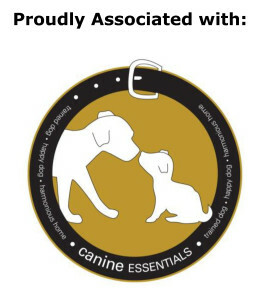 All of Canine Essentials’ dogs are rigorously inspected for fleas and are treated with a monthly flea and tick preventative medication. Nursing Essentially reserves the right to change prices without notice. We will however, honour all packages purchased prior to price change and not require payment of additional monies. If sessions have been purchased in advance, we will honour those sessions at the price quoted. Nursing Essentially will honour any and all written quotes despite changes in price within a reasonable period being 6 months. Services purchased at a special price will be honoured until the expiry date – which will be strictly identified when purchasing the services at the discounted price. All prices referred to are in Australian Dollars only. Nursing Essentially does not currently charge G.S.T for services. Nursing Essentially complies with ACCC standards in relation to itemisation of accounts and providing the client with proof of their transaction with Nursing Essentials. Nursing Essentially must provide proof of transaction to consumers for goods or services valued at $75 or more. A GST tax invoice is sufficient proof of transaction. ‘Proof of transaction’ for supply of goods or services to a consumer is a document that states the: supplier of the goods or services, Nursing Essentially ABN, date of the supply goods or services supplied to the consumer, and price of the goods or services. Nursing Essentially must give proof of transaction when a consumer: buys goods or services worth $75 or more (excluding GST), as soon as possible after the transaction, or, asks for proof of transaction for goods and services costing less than $75, within seven days. How the price was calculated, the number of labour hours and the hourly rate (if relevant), and a list of the materials used and the amount charged for them (if relevant). The services are supplied, or the consumer receives a bill or account from Nursing Essentially for the supply of the services. Nursing Essentially must give the consumer the itemised bill, without charge, within seven days of the request. It must be expressed in plain language, legible and clear. Nursing Essentially has specific terms and conditions related to refunds. We allow 3 business days from date of purchase and prior to the starting date when granting a refund for cancellations. Once lessons have commenced, all fees shall be due and payable. There will be no refund for clients who do not show up for tutoring sessions without prior notice and any monies paid to date will be forfeited. Uncompleted sessions cannot be transferred to other future Nursing Essentially services without authorisation by the Director of Nursing Essentially. Nursing Essentially will consider it a completed lesson if clients arrive later than 15 minutes after starting time and will be charged accordingly. If the problem is not major, we will fix it within a reasonable time. If it is not fixed within this time, you can choose to have someone else fix the problem and recover all reasonable costs from us. If the problem cannot be fixed, we view it as a major problem. Please keep proof of your agreement—e.g. your invoice or quote. 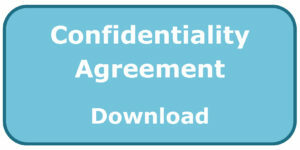 Full payment for all services (including packages) must be according to the terms agreed upon in the Services Contract. Payment plans for services are offered under special circumstances with prior negotiation with the Director of Nursing Essentially. Pre-set payment dates and amounts will be determined prior to the first session. Payment methods are either by Direct Deposit, PayPal, EFTPOS, Master Card, Visa Card, American Express or Cash. A receipt will be provided upon payment. Nursing Essentially has specific terms and conditions related to cancellations. Cancellations will be automatically charged if Nursing Essentially is not notified within a reasonable period of time – being 24 hours’ notice. It is recommended that the session be rescheduled within the same week (subject to availability). 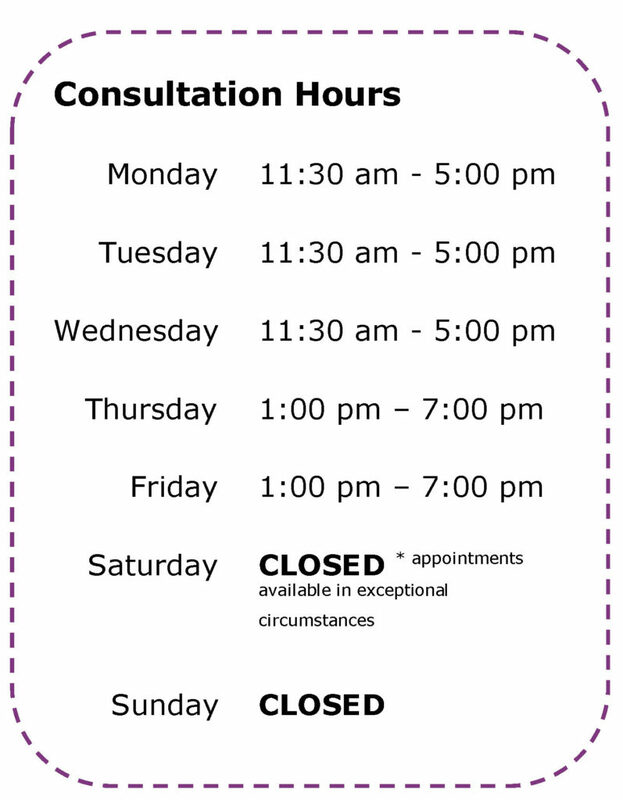 If tutors are not available, Nursing Essentially highly recommend that the original scheduled session times be adhered to. Exceptions to this will be when the student is unwell. Nursing Essentially, reserves the right to cancel or reschedule any sessions or course. Clients will be notified via telephone or email. Please check your messages prior to commencement of session. Nursing Essentially reserve the right to terminate sessions and refund monies owing if we believe the circumstances are not going to be beneficial to either the client or Nursing Essentially. o Work Health and Safety Act (2011).